It's here, it's here! The final of the four elemental yoga practices! This time we are looking at the element of air. We will focus on the breath, prana, life force energy. This element is connected with the heart chakra, which makes sense due to its proximity with the lungs. We will be opening up and creating space in the chest, the shoulders and the upper back. This will help to tap into a fullness of our breath. This is a great practice if you feel lonely or disconnected. Breath connects us to all other living beings, as we all breathe the same air. In each of these, as always but more so here, prioritize the breath over the pose. The following is a string of poses which come from my full 40 minute video, Air Element Yoga. No props are necessary, but if you like to use them in your practice feel free to have them handy. Let's get started. 1. Pranayama - Sit comfortably, bringing the right hand on to the low belly and left hand over the heart. Close your eyes and imagine yourself opening to receive the breath, as if you are being breathed by the world. Inhale feeling the rib cage expand for a count of 3, continue inhaling towards the low belly for a count of 3. Hold this deep breath for another count of 3. Then start to exhale, feeling it leave the belly for a count of 3, out of the chest for another 3 and holding the empty breath for 3. Continue the cycle, evening out your inhalations and exhalations, feeling yourself expand front to back and side to side. 2. Chest opener - laying on your stomach, reach the left arm out to the side. Your hand will fall roughly in line with the shoulder. Roll on to the left shoulder, hip and ear. Bend the knees if it feels good. Choose to press into the right hand in front of you, or reach it behind to rest on the low back. Keep the right shoulder drawing down, away from the ear. Imagine intentionally sending your breath into the left shoulder. Slowly unwind to return to the belly, then switch sides. You may notice that one side is tighter than the other. 3. Low lunge - from downward dog, step the right foot through to the front of your mat. Lower the left knee to the ground. Lift the chest and hands, as the tailbone reaches down. Clasp the hands behind you, interlacing the fingers. Bend the elbows, bringing the hands to your tailbone and squeezing the shoulder blades together as you lift through the chest. 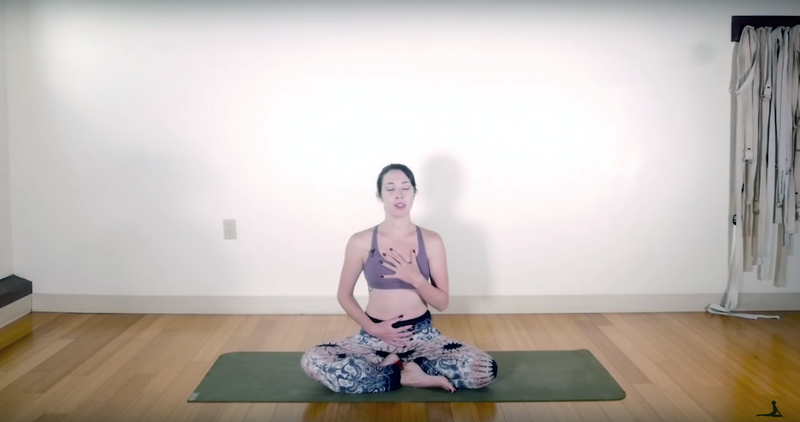 Take a moment to breathe and connect to your heart space, as well as those around the world doing the same practice. 4. High lunge/Warrior 3 - with your back toes curled under, come up off the back knee into a high lunge. Straighten the elbows and lift through the chest. As you exhale, dive forward and down. Aim to keep the belly up hovering off of the front thigh, as you lift the knuckles up and over. This is a strong pose, engage through the glutes, reaching back through the knuckles. Inhale back up. Step down on your right foot as the left leg lifts up, coming into Warrior 3 with palms still clasped together. Instead of staying parallel to the ground, think of pulling the chest forward and drawing the shoulders back (like in a cobra). 5. Standing pigeon - from Warrior 3, bring the hands together at the heart as you come upright. Cross the left ankle over your right thigh and open the knee out to the side. Bend into the standing leg, sending the hips back and shining the chest forward. Stay as is, or to go a bit deeper, bring your hands to the ground and fold over the legs. Return to the breath, if it ever feels stuck it is a good indication that you have gone too far in a pose. Repeat poses 3 through 5. 6. Twisted monkey - from down dog, step the right foot to the front but to the outside of your right hand. Lower your back knee down, curl the front toes up and roll onto the outer edge of your right foot. Come down onto your left forearm as you sink the hips down. Right arm reaches all the way to the back as you bend your left knee, catching hold of the left foot. Instead of pulling your foot in, push the foot into the hand and open the right shoulder back. The chest opens, as your gaze likely turns upwards. Open to receive the breath. Switch through to the other leg. 7. Wide-legged forward fold - facing towards the long edge of the mat, take the legs wide and feet parallel to the short edges. Hinge at the hips, bringing the fingers down to the mat. Set your left hand in the middle, directly below the face, and push into your hand to flatten the back. Open right arm to the sky, as you twist your torso in the same direction. With ease, switch sides. For more advance apex poses (i.e. dancer's and bow) practice the full video below.